Introducing Caution Cling Road Safety Decals! 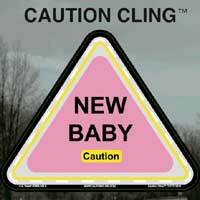 The CAUTION CLING™ is designed to promote road safety for our new and senior drivers and drivers with baby’s aboard! Caution Cling’s mission is for all drivers to be conscious, courteous and caring as we share the road. Caution Cling, LLC is a family business inspired by Thornell & Gina Phillips daughter who had just began learning how to drive. Gina created the product, her two daughters collaborated in the design of the clings and her husband Thornell was instrumental in getting the final product manufactured and made in Michigan! Ultimately Gina was issued a US patent and started a business to share her product with the world. 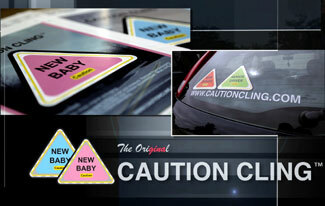 Caution Cling is available in orange for new drivers, green for senior drivers and new baby pink and blue for the baby’s gender. 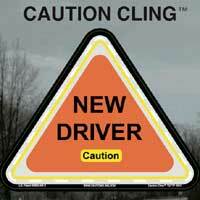 The purpose for Caution Cling is to alert others of a new or senior driver and infant or toddler passengers. The Caution Clings are unique in that they are repositional, reusable, reflective and weather resistant. To alert other motorists, place in a visible area of an automobile to encourage patience and drive with extra care when near a new driver. 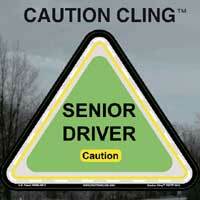 Each Caution Cling is identifiable by its color, shape and wording – even if driving at a distance.